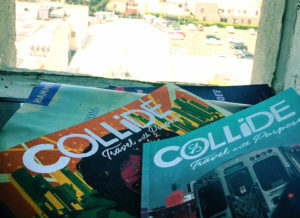 For the past four weeks, I’ve been interning at COLLiDE creative agency in Los Angeles, California. It’s my first time in LA, and my first internship – but I can truly say it’s already been one of the most rewarding experiences I’ve had thus far in my academic career. COLLiDE defines itself as a creative and culture agency. I like to think of it as an umbrella company, as we produce a lot of diverse content across different platforms. We have a publication called Travel With Purpose that is published in special versions multiple times per year. We just finalized the Travel With Purpose: Guide to Chicago and are currently working on the Guide to LA. 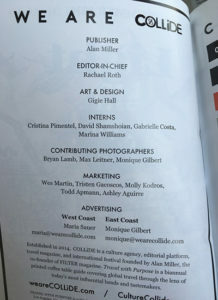 In addition to the publications, CultureCollide.com is a platform for music and film reviews and news, travel guides and recommendations, and news on the latest work from artists all over the world. Thus far I’ve been able to be very involved with the production of the publications and online content. As one of only two interns in our LA office, I’ve had the opportunity to work with the editor-in-chief, Rachael Roth. I’ve listened to new music to be premiered on our site and written reviews for the articles. I’ve been able to write up my own questions and interview bands and artists and publish these interviews on the site as well. What I’ve enjoyed most, though, is being able to accompany Rachael and other co-workers on shoots we do with local bands. We met up with LA-based girl band Deap Vally for an interview/photoshoot for the upcoming LA guide, and I learned a lot by taking photos of them and writing notes for the article we will feature. For the remainder of my time here at COLLiDE, I’ll mostly be working on the Guide to LA and the website content. Luckily for me, because the publication we’re producing now is featuring the city we are in, I’ll be able to actively participate in taking photos for the publication and writing for it. I’ve been exploring Los Angeles on my time off, and bringing my camera everywhere I go so I can photograph the places we are going to feature in the Guide to LA. The idea of being an intern for a company in a city like Los Angeles initially worried me. I was afraid I wouldn’t be able to stand out or make connections. To my surprise, working at COLLiDE has been a much better experience than I expected it to be. The office is small and close-knit, and I’m confident that the content I’m producing and the connections I’m making are going to help me get my foot in the door in the future.